Welcome everyone to the Create with Connie and Mary Saturday Design Team Blog Hop. The last two weeks the team has done Halloween cards and this week we each have a little Halloween Treat for you! Fun, Fun, Fun! 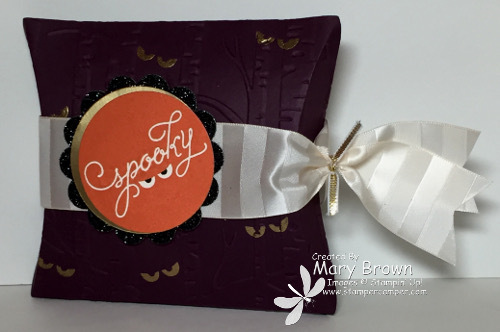 I have not used the Square Pillow Box Thinlit yet so when I knew this week was going to be a small Halloween Treat, I knew right away I would use that! I also had not used my Among the Branches set much yet so I put those two things together for my treat for you! Blackberry Bliss – cut out two of the Square Pillow Box thinlit, run through the Woodland embossing folder. Wrap a piece of the absolutely YUMMY Very Vanilla 1 1/4 Subtle Stripes Satin Ribbon, to using Gold 1/8″ Taffeta Ribbon, trim ends. Stamp Spooky circle image on Very Vanilla using Tangelo Twist, color in eyes using Basic Black Marker, cut out using Circle Framelit. Gold Foil – punch out 2″ circle, layer under the spooky circle leaving more gold showing at the gop. Black Glimmer – punch out 2 3/8″ Scallop Circle, layer spooky in this than add to pillow box using dimensionals. No THAT is easy! And you know what else is easy? Signing up for the Create with Connie and Mary September Mini Session! We have 3 cool card sets and 2 AWESOME 3D projects (and a bonus card set still to come) for the Create with Connie and Mary September Mini Session. 2 of the card sets are Halloween as is one of the 3D projects. WELL…we know that not everyone is into Halloween (although…have to say…REALLY cool Halloween ‘stuff’ this year) so we (Connie and I) decided to remake some of the Halloween into Christmas…JUST FOR OUR SUBSCRIBERS! 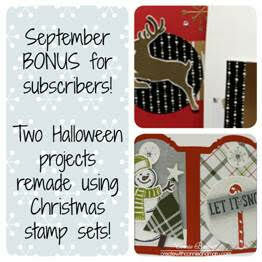 So if you weren’t sure you want to subscribe this month (September) because of all the Halloween ‘stuff’…you are getting two BONUS projects as we remade Debbie’s cool Table Top decor and two of Deb’s Haunt Ya Later cards into Christmas AND is giving all the details on not just the original project but also these new ones. COOL!!! The session opened September 13th! This entry was posted in 3D, Create with Connie and Mary, Halloween, Holiday Mini, Saturday Blog Hop and tagged Among the Branches. Bookmark the permalink. Spooky treats with a little elegance! I LOVE the way the golden eyes look against the blackberry! Awesome inspiration!